Working across industry verticals, DEP recognizes that optimization scenarios today are multiple objectives and multivariate in nature. The evolving needs and DEP’s in-house Engineering processes has led to optimization methodologies and tools that address various scenarios and our strategies suit different stages of product development. 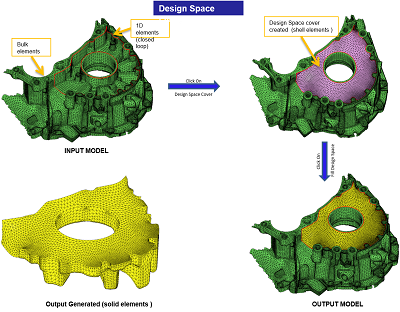 MeshWorks which is our proprietary CAE platform has set of tools that drastically reduce time for creating math models for traditional and non-traditional optimization processes. 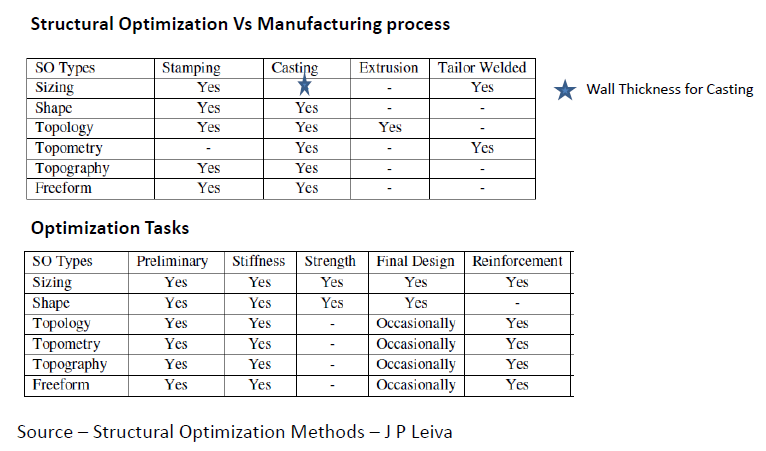 Traditional optimization methods like topology, shape and size with due consideration to manufacturing process are now used in combination rather than serial or a standalone method to arrive at optimal solutions. 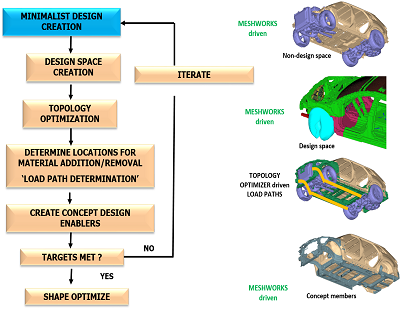 DEP MeshWorks has set of tools like Design Space Creators, Shape and Size parameterization, Design Enablers which when combined together with optimizers like GENESIS, TOSCA, OptiStruct and NASTRAN provide stronger platform for engineers to explore optimized designs. 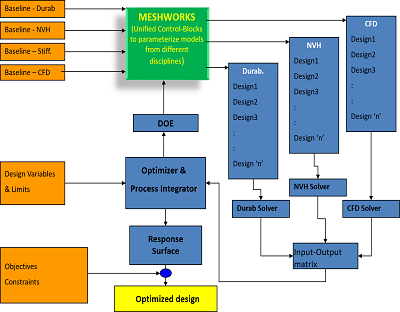 Usage of MeshWorks in optimization scenarios addresses multi objective, multi variate optimization problem with the patented parametric model based approach providing interfaces to optimization engines like ISight, modeFRONTIER and others. 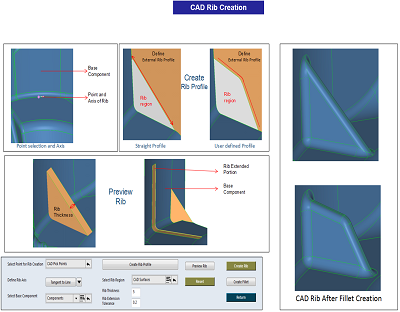 MeshWorks can look at not just shape and size as parameters but goes beyond to have welding, adhesives, feature parameters (beads, darts, ribs, and bulkheads), topology parameters, part extenders, material parameters thus providing wide array of parameters that could be used and benefited from. 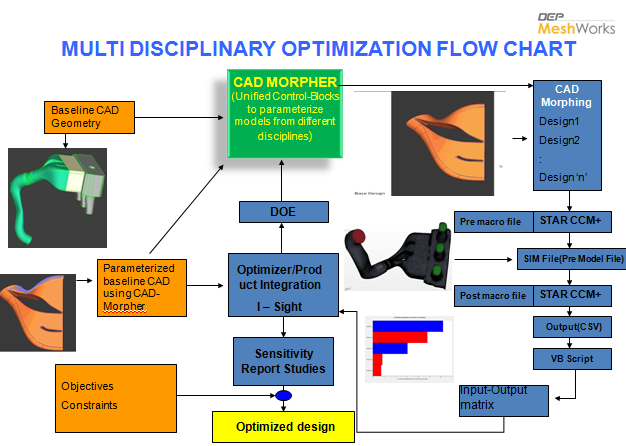 Even for Flow optimization, MeshWorks has CAD morphing and parameterization based approach in conjunction with Design of Experiments that can provide unique solutions to explore the design space and arrive at optimized results. At DEP we implement the generic approach via set of tools, optimizer, algorithms and math models as well as the engineering judgment guided approach which has proven track record of demonstrating success on several systems. We named it as Minimalist design based optimization. This has been significant in terms of providing best implementable solutions in the shortest time window. 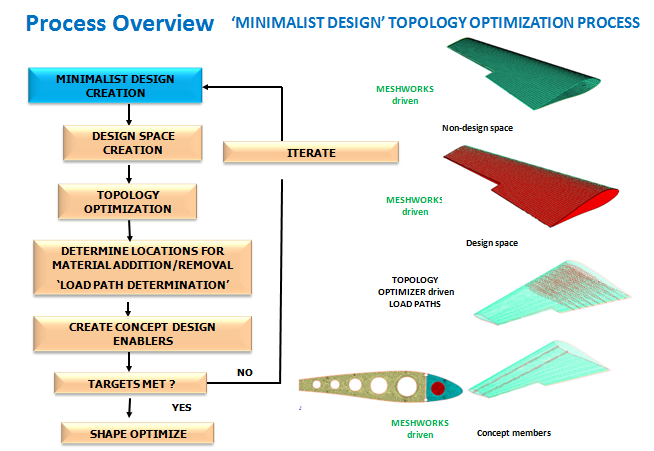 Minimalist approach is combination of topology optimization with feature, shape and size. 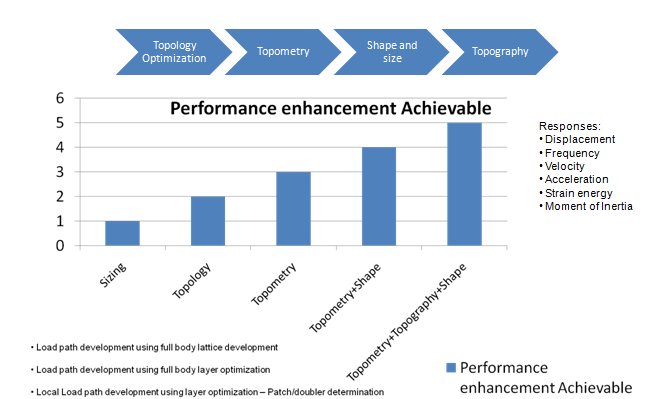 We delivered significant benefit for our customers through the 3G+ optimization methodology that basically combines topology (load path), Geometry, Gage, Material Grade and Feature parameters. Such optimization methodologies not only provide weight optimization but also provide opportunity to explore material grade and gage combinations that are effective. This methodology pushed ahead in the automotive product development process has provided customer with deep insight and various options to implement considering quality, cost and time parameters. 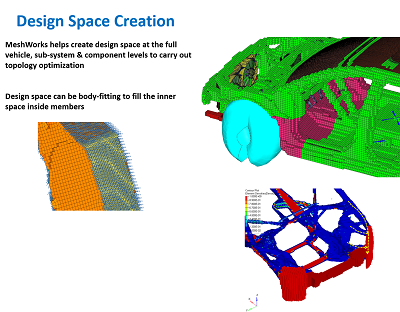 MeshWorks has tool set to look at optimization considering additive manufacturing process. 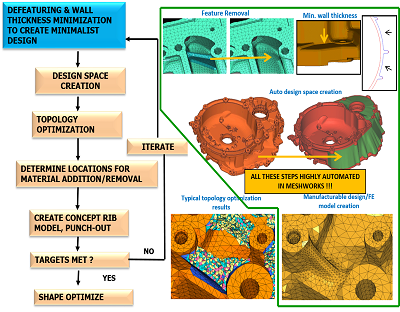 It has options to convert design space created in it to lattice layout thus offering feasibility to arrive at novel optimized solutions that could be realized using additive manufacturing process. This Minimalist approach will significantly help Powertrain engineers, structural engineers, farm equipment engineers and engineers dealing with heavy machinery with options to arrive at weight savings without sacrificing any performance metrics. 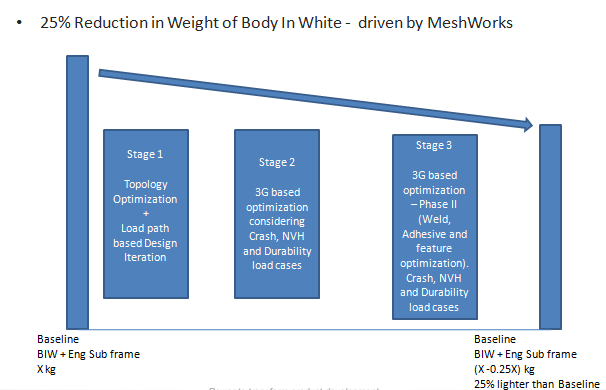 The approach of applying MeshWorks capabilities has been well received for internal flow problems in the Powertrain domain as it is independent of pitfalls due to mesh parameterization approach over larger range of design parameters. Most important and strong point of DEP MeshWorks is the ability to convert optimized solutions obtained using mesh form of math data into CAD math format. Apply deformation tool in MeshWorks plays unique tool to transfer the optimized outcome in the form of mesh math data to baseline CAD so that the product team can have good head start. Thus it not only closes the gap in the optimization process but also adds pace to downstream product development activities. 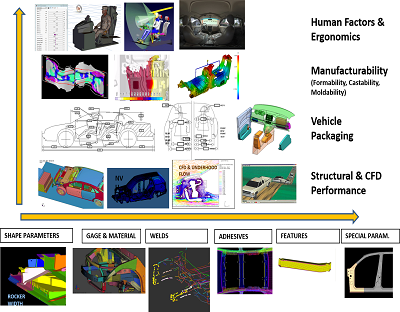 At DEP we feel the combination of traditional and non-traditional (parametric) optimization process up ahead in automotive product development process to provide significant benefit to engineers in terms of design alternatives, and trade-offs.